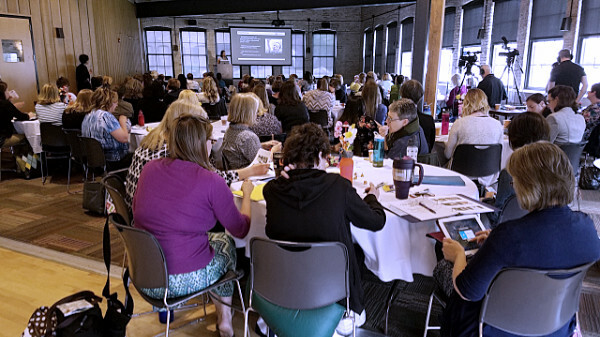 On Friday, May 12, 2017 IABLE's “The Art and Science of Breastfeeding Conference.” at the Goodman Community Center in Madison, WI was filled with attendees eager to increase their knowledge and skills in supporting breastfeeding mothers and children 2017. The program began with a presentation by Patricia Smith, OTRL, IBCLC,CIMI, RYT200, an Occupational Therapist for 25 years and Lactation Consultant for 6 years, who has a private practice with a special interest in assisting babies with oral issues. She provided a detailed and thorough review of how to assess basic oral function in babies, and also covered the importance of the initial breast crawl following birth, the importance of tummy time and its impact on breastfeeding, supporting normal infant reflexes, and the impact of the “Back to Sleep" campaign. She also covered lymphatic drainage and how it can help mothers dealing with mastitis. She reviewed calming techniques for both mother and baby. This talk was filled with practical, useful and helpful tips for assessing and understanding signs of deviations from normal and interventions to support breastfeeding success. The next speaker was Laura Hernandez, PhD, Associate Professor in the University of Wisconsin - Madison Department of Dairy Science. 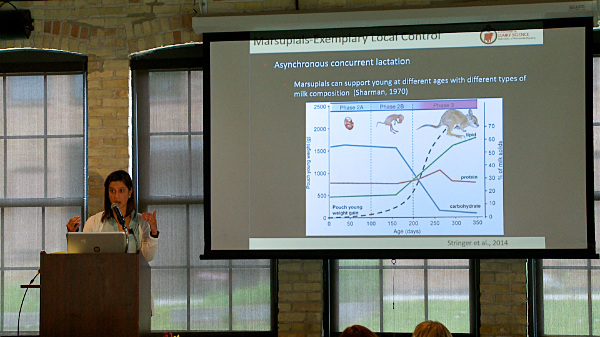 Her topic was titled “Feedback inhibitor of Lactation and Regulation of Milk Secretion.” She detailed research on milk production in rats, cows, and marsupials and explained how this relates to our understanding of human milk production. 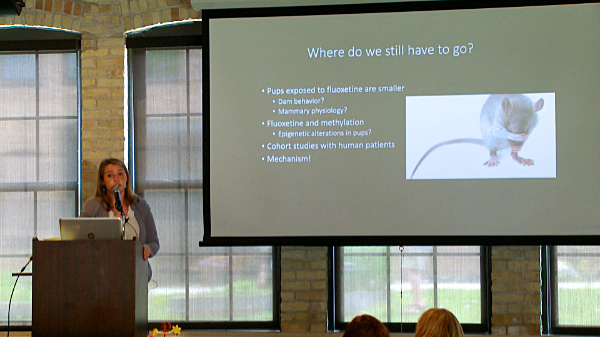 This talk provided us with the science underlying our understanding of the interplay of hormonal influences and the active role of the mammary gland itself. It was new information with important implications, presented very effectively. Samantha Weaver, a third year PhD student, shared her research on SSRI antidepressants and their effects on bone health in pregnancy and lactation, using a mouse model. Her findings have major implications for human mothers in terms of the current widespread use of SSRI antidepressants. While most previous research has focused on effects on infants, this looks at effects on mothers and their short and long term bone strength, raising new questions and challenges in supporting and treating depression. Later in the afternoon, Laura Hernandez spoke on the topic of “The Relationship Between Maternal Obesity and Delay in Lactation: What Is Happening at the Level of the Mammary Gland?” With 1/3 of the U.S. population currently fitting the definition of obese, and 20.5% of mothers entering pregnancy with a designation of obesity, this topic is of great importance to lactation counselors. Obesity is associated with chronic inflammation and a delayed onset of lactation. Hernandez cited the newest research in mouse models and in human lactation from around the country and explained the roles of estrogen, progesterone, Vitamin D, prolactin, insulin and other hormones in milk production. The influence of a high fat diet in mice on pregnancy completion, lactation, mothering behaviors, and pup survival was detailed. While her area is Dairy Science, she was very familiar with issues of human lactation and tied all the research on mammals together well. The final speaker of the day was Gretchen Crabb, OTR/L, CLC,IMH-E, and La Leche League leader, who has a background in working with children in Birth to Three, Early Head Start, Head Start, and autism intervention programs. 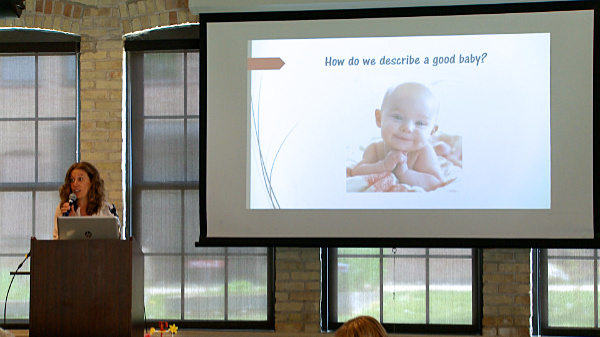 she helped us to understand the influence of sensory impact in her talk titled, “Sensory Co-Regulation and the Fussy Baby." She reviewed all the 8 senses, and how each influences baby behavior and breastfeeding success. She reminded us that crying is a late cue of hunger, and provided guidance in observational skills and practical ways to support parents and infants in successful feeding. She used videos to demonstrate her points and challenge us to observe and identify sensory influences on breastfeeding behavior. She emphasized the importance of viewing the infant in the context of the child-parent relationship and not in isolation. 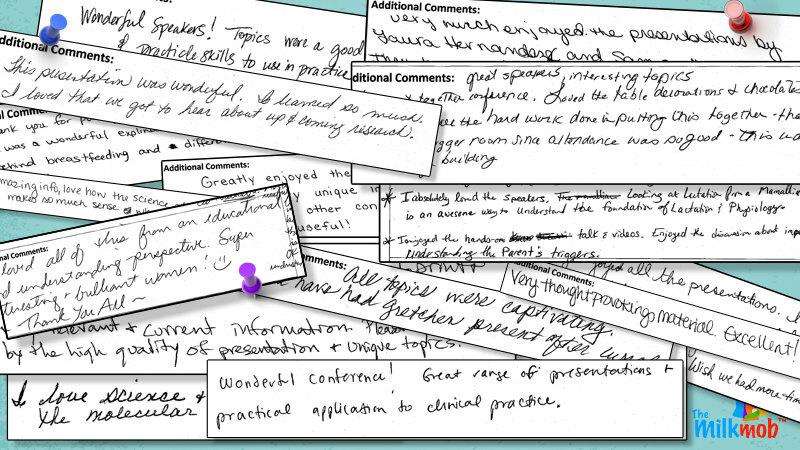 Overall, the attendees expressed enthusiasm and positive reviews for this conference. 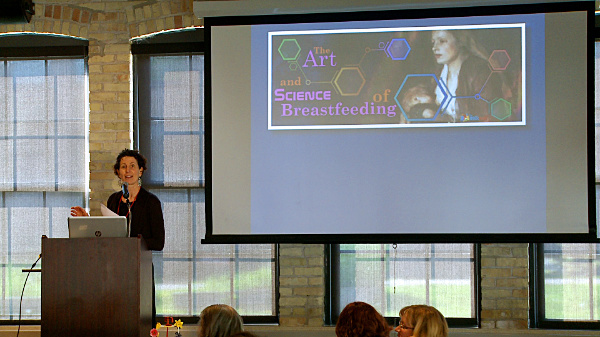 In particular many people enjoyed the opportunity to hear from bench scientists in the field of lactation. We hope to make this an annual event! Many thanks to Anne Altshuler, RN, MS, IBCLC, La Leche League Leader, for writing this article.